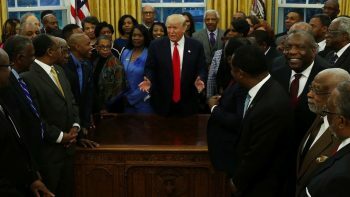 THE PRESIDENT: Well, I’m deeply honored to welcome the members of the Congressional Black Caucus to the White House. We’re going to have a lot of meetings over the years, and I very much appreciate you being here. Throughout my campaign, I pledged to focus on improving conditions for African American citizens. This means more to me than anybody would understand or know. Every American child has a right to grow up in a safe community, to attend great schools, to graduate with access to high-paying jobs. So far so good. Typical white politician lip service. But from a Republican, that's about the best you're going to get. America has spent trillions and trillions of dollars overseas. I guess -- I heard just recently in the Middle East we’ve spent as of about two months ago $6 trillion -- $6 trillion, and you know where we are over there -- while neglecting the fate of American children in cities like Baltimore and Chicago and Detroit. It's actually $2.4T but that's still a disgustingly large number; and, hmm, what did we spend that money on? Oh right, Republican wars. But I'd be happy to see Trump provide funding for children in inner city Baltimore, Chicago, and Detroit. It doesn't seem like that's really a priority of his though. You know, one of the most efficient ways to reduce violent crime amongst teenagers is to FUND AFTER SCHOOL PROGRAMS! African American citizens have given so much to this country. They’ve fought in every war since the Revolution, and they’ve fought hard. They’ve lifted up the conscience of our nation in the march toward civil rights, enriched the soul of America -- and their faith and courage. And they’ve advanced our country in the fields of science, arts and medicine. Yes, they've always fought hard for freedom and equality in this country which for hundreds of years has taken so much from them but given so little back. So why is he targeting government programs that are geared towards helping minorities? A $6 billion cut to HUD and Urban Block Grants will put up to 200,000 poor inner city families out on the street. Elijah Cummings, who was here about two weeks ago, who I happen to think is a terrific man -- I don’t know if he’ll say that about me, but I will tell you, I really liked him a lot. And we were talking about drugs and prescription drugs and the costs. And you go to Europe, you go to Canada, you go to other countries and you buy them for a fraction of what you pay in this country. And that’s been a very big subject for him, and it’s a subject for me that is very important. And we’re going to either do it in healthcare -- which I think we’re going to do it in healthcare -- or we’re going to do it separately. Trump clearly was losing them so he through out a name of a Black guy he met a few weeks ago and gave him the best compliment he had in his arsenal: terrific. And then his mind went right to drugs. But we’re going to bid on drug prices, and we’re going to try and have the lowest prices anywhere in the world, from really the highest. And that’s not only the drugs, it’s prescription drugs. But you go out to stores and you go even -- in any community, rich or poor community, and you look at the kind of drug prices that we’re paying and it’s really unfair what’s happened in our country. Really? Really? Really? And how do you expect to do that when precedent from the government is behind giving Pharmaceutical Companies the right to force Americans to subsidize drug prices around the world? Here's a great example. So we’re going to be instituting a very, very strong bidding process. We’ll probably need some legislation, but we’re going to do it regardless. We have to do it. And we’re going to get drug prices way down, way down. Some people think it’s as important as the healthcare measure, because people are being ripped off when they need their -- they need drugs, they need prescription drugs. And we’re going to take care of that situation. Sorry, that's not going to work unless you're looking at a Single Payer system in which the government serves as the sole buyer of prescription drugs and thus can negotiate cheaper prices. And anyway weren't you addressing the CBC? How did we end up talking about drugs again? So again, I very much appreciate you being here. It’s a tremendous honor for me. And we’re going to work on different things, and we’re going to see if we can get a lot accomplished. And with that, let’s get going. And thank you all very much. I guess I shouldn't be surprised that Trump couldn't even string together a three minute speech without going seriously off-topic. Nor that he even had three minutes of material about black people. Oh well. Catch you on the flip side.